Well the dress itself didn't take a whole year- we've made several in the past year! But creating the sewing pattern with all the options that I thought (and rethought) it should have and getting it all fine tuned, published, printed, shipped, etc. That took a year. But it was worth it. I love, love, love, this dress. I originally jumped into the design here, when I was all about zigzagging, which I totally still am. The humble beginning of this dress was simply that I had made two Folk Dance Quilt tops, a warm version and a cool version, and couldn't decide which to photograph for the free pattern download. While we were preparing a shoot for the Good Folks collection I picked up the warm toned unfinished top and thought...wow, this would make a great dress. And it did. I simply wrapped the raw edged unfinished quilt top around Juliana, took a few quick measurements, fashioned a quick bodice that echoed the triangle design, pinned it all around her, clamped it tightly in place and had a fun photo shoot. And then the emails started. Why didn't I see that coming? I never see that coming. Depending on your level of devotion to all the patchwork-y love though, there are four different options in the sewing pattern with various doses (or no dose at all) of the zig zag motif. Not to mention numerous combinations of making the dress strapped or strapless, short, mid length, full length and so on. All options are designed for the dress to be lined with an invisible side zipper. Strapless versions are designed to have a clever invisible elastic channel at the upper back bodice for additional support. Don't ever say I'm not supportive. I am here for you. And after a year of working on and off on this one with all of its intricacies, I have to say, I am quite smitten with the simple mid length non-patch version. It is quite the ideal spring/summer/fall dress and I want one in every color to wear with every sweater, belt, necklace I own. And the pattern could not be better suited for the voiles, both for the outer dress and the lining. It's like wearing a cloud. Thanks to so many (sooo many) of you who have emailed me ever since you saw the humble and spontaneous version here first last year and have waited so patiently for the debut of this pattern. And even thank you to those of you who have waited so impatiently (only if you consider a weekly email impatient). Enjoy! It's now available here and several other shops around the globe- so check your local fabric shop! More pattern news coming later this week, and also some tips about sewing with voile! Very pretty! I would love to throw those on in the summer and go about my day. Great job, and beautiful fabrics. I absolutely love this dress. It sure would grab anyones attention. Your fabric looks stunning. Good job, Anna! It is gorgeous. Wonderful! Congratulations! Is the child's pattern available? Oh, I love,love ,love this! I am so excited!!! Anna - right after I emailed you about using the picture on my blog, I ordered your amazing pattern. When my mum came for a visit this week the first thing I did was show her the dress and make her promise to help me the minute I get the pattern and the fabric - I too will have this dress in every voile fabric and different variation of pattern availabl! Thanks so much for another wonderful pattern (and beautiful fabric to go with). PS - I made my mum the voile scarf as a thank you in advance for helping on the dress and she emailed that she has had a hard time taking it off she loves it so much. i'm pretty excited about the simple dress! yay! Amazing, as usual! You always inspire me to make clothing even though I usually don't!! Thank you so much! But well worth the wait! What a beautiful summer dress. Gorgeous...can't wait to make one into a maternity dress!! Yeah!!! I loved the original picture and hope to make a dress like that! I already ordered mine and I'm waiting very impatiently for it to arrive! So beautiful you talented lady!! I love them!!!!! They are all awesome, now I know what my next project will be! so exciting! my daughter and i are going to have matching easter outfits out of your lovely voile and this is perfect! Thank you for all of your hard work! Your beautiful pattern just *made* me order it and the exact same fabrics for views A and C. Can't wait to make them for summer! Oh my goodness!!! This is just beautiful!!! I'm usually not a dress kind of girl, but I just might be now! I just love dresses like that. To bad I look like an elephant in them. Me today and I've barely looked at it and I can tell I love, love, love it. So, so beautiful and I can't wait till your new book is released!!! Very cute! I am anxiously awaiting the hand bag and tunic/dress pattens I saw you show at Quilt Market. Hopefully that will be part of your upcoming pattern news??? Can't wait! i am in love with those patterns!!!!!! way to go! GORGEOUS! looks like it was well worth the effort....and i'm definitely drooling over the fabrics, sigh. ohhhh! this pattern is fabulous!! new knee length dresses are calling my name! Lovely work as usual...I'm drooling over my voiles. I just take them out, touch them, press them, fold them back up and stack them neatly on my cutting table, hoping someday they will become garments. Right now it's enough to have a lovely (and very tall) stack to inspire me day after day! Ahhhhh yes, the empire dress. I have to tell you I wish that "evening" was nowhere in the title. I tried to convince my mother to order this pattern for our shop and she said... "It's an evening dress", without even looking at it! I should've just added it to the order list anyway but I couldn't believe she said that! Beautiful! I love it! Do you think it could accommodate a pregnant belly? It looks like it might be a good second trimester dress, which I will need in a few weeks! I think I may need this! Thank you so so much for this pattern. I saw the dress this summer when I "discovered" you & have been waiting anxiously for it to arrive. Perfect belated birthday present to myself. My painful frugality and constitutional inability to buy fabric online had left me pining and without your fabric for far too long. I finally ordered Social Climber* and one of the voiles, and they arrived today. I knew they would be pretty. I knew they wouldn't disappoint. I didn't know the sheen and hand and utter silkiness of the voile would make me choke up. Seriously, woman. I am in awe. More voile is already on its way to me. *Don't even get me started on how much I love the Social Climber print. Nobody but you and Willendur in the 50's knows how to print roses on cotton like that. Oh my, only a year..snicker...I think you have been busy! 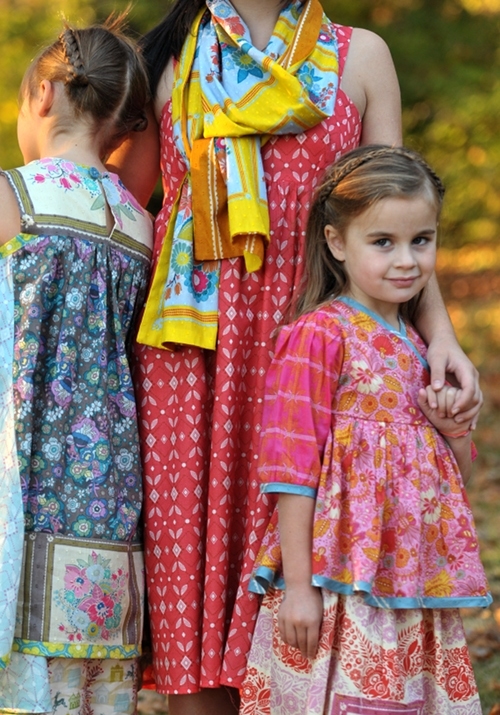 I love this pattern and will be waiting not so patiently for the child's patterns too! I cannot see myself in anything but...this will be my wardrobe all summer and fall! Thank you so much for all your hard work! I'm loving your fresh take on the perfect summer dress! Your thoughtfulness in creating a pattern that is designed to be customized to fit our style and needs is much appreciated! I just ordered enough voiles to choke a horse on quilt home.com, they are giving 30% off your voiles today! yippie skippie!!!!! and of course the pattern for the dress, and the new bag. seriously. love them. Oh my goodness! I just love the strapless dress.....a must have! Love it! 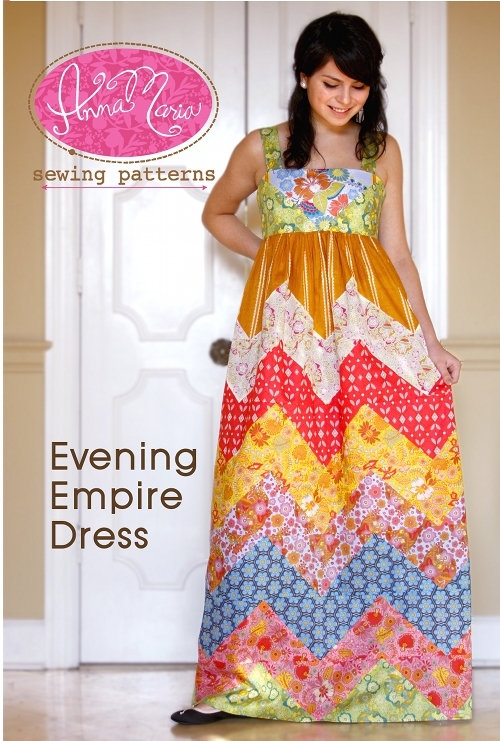 We love carrying the voiles in our store CityCraft here in Dallas, Texas, and we can't wait for the Evening Empire Dress pattern to arrive sometime this week! Oh, I've already got the pattern! I was just itching to get it as soon as it came out. :) Can't wait to stitch something up! lots of love to you, Anna! I love the dress! It reminds me of one I saw of Sharon Rockefeller wearing back in the 70s. I'm glad fun patchy things like this are coming back. I love this pattern! I had to get it the second I saw it. Beautiful! Oh please oh please do the children's patterns!!! I would love to make some with your fabric for my two little girls. Oh so worth the wait! beautiful! love it! reminds me of a vintage lilly patchwork skirt i have! yah spring!!! ps. do you ever do shows in Louisville? would love to come down to Nashville, but just wondering!! Fanciful and fun -- just what a summer's day needs. And please, please make the girls' dress patterns, too! Please get the voile tips up fast...I have your diamond mine in sky for my daughter's first Easter dress and need to get started. I am thinking a simple bishop dress with geometric smocking to mock the fabric pattern. So get to tipping! It is BEAUTIFUL! Well done and worth the wait! very reminiscent of the old hippie dresses on phish lot and dead lot! interesting to see your take on this classic lot dress! Pretty! Awesome! You should be very proud. Hey I've been waiting for that pattern! Thanks. I love love love this dress. It is super cute. oh goody goody!!! Sooooo buying this one, thank you! Please give the measurements for the scarf too, I looooove that one! Typically I don't mind aging. But today I do. I want to wear that dress, not just admire it!! love, love, love it! i'm ordering a copy now, and looking forward to beautiful new spring dresses! thank you, as always!, for all your hard work!! How striking! I am just in love with all of your clothing. I must think about sewing some of them for my daughter and me for summer! I'm still looking for this pattern designed by your daughter, is it available now? I know my daughter would love it! You voile is beautiful!! I just made 3 dresses for my girls, so nice to sew with, beautiful to touch and washes so well (and a lot less ironing needed than quilting fabric). I absolutely love it! I want all four of them...my desire to learn pick sewing back up is growing as I type. Geesh! I completely LOVE this dress! Thanks for being so talented! I love the beautiful fabrics! They just make you happy:) The actual dresses are gorgeous too. Wow I really can see how much work this pattern must have been as a pattern maker myself. I believe you are gifted beyond measure since each time I see a work of your hands I see a glimpse of your genius growing even more! 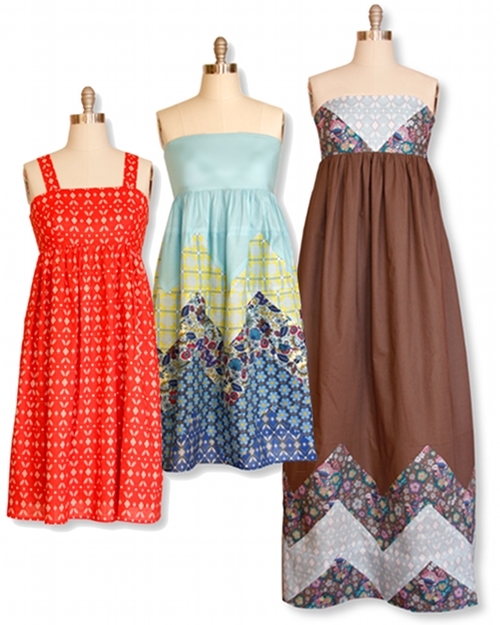 Aw what a cute dresses, I really love the girly cloth so this fabrics looks very girly and sweet! I love that job! All of those photos are so beautiful, and looks so well done! congratulations to the designer because is a really good idea of clothes! Hello to everyone who has blog.first I congratulate the blog owner.he is got excellent blog.That is really very good article. I am glad to know. Thanks for sharing ! I think this is one of the best sites out there. It has so much information. I certainly love this website, keep on it. Have a good day! Excellent blog and post. Thanks for sharing...!!! It's really beautiful work.Thanks for this kind of stuff.I mean I am totally impressed.Hope to see more updated work here.Ihave to say, it is very informative. Hope to see more updated work here.Ihave to say, it is very informative. thank you so much so nice site . This is a great blog. Thanks for sharing all the information! A lot of people in our industry haven't had very diverse experiences. So they don't have enough dots to connect, and they end up with very linear solutions without a broad perspective on the problem.